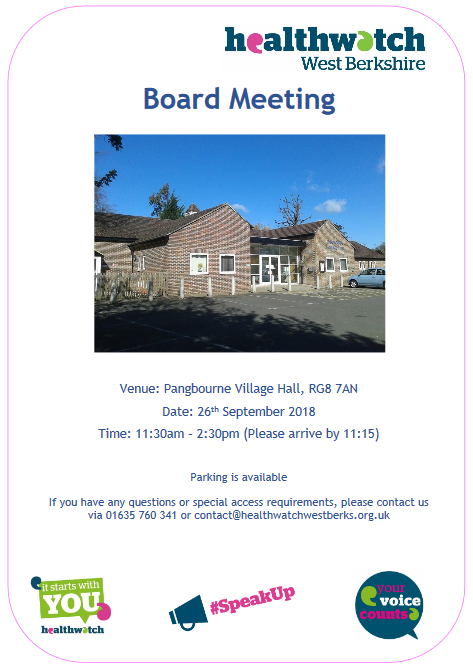 We are holding our next Board Meeting in public on Wednesday 26th September 2018 from 11:30-14:30 at Pangbourne Village Hall. We ask that members of the public arrive by 11:15. This is your opportunity to speak up and ask our Board Members questions. If you have any specific questions please submit them in writing before Friday the 21st to Healthwatch West Berkshire, Broadway House, 4-8 The Broadway, Northbrook Street, Newbury, RG14 1BA, or phone us on 01635 760 341, or email contact@healthwatchwestberks.org.uk.